Bob Woodward’s Fear is not a book about Politics. It’s a book about office politics at best. Which is a shame, because the author had gathered all the material necessary to ask some very pressing questions of the conservative movement in the United States and beyond. Had he not chosen to spend so much time delving into the psychology of Donald Trump – surely one of the least enigmatic figures in the world today – we might have a better understanding of where his administration and the American juggernaut are heading. Even as a workplace drama, Fear is a disappointment. We are promised in the prologue the story of the ‘nervous breakdown’ of the executive branch of the US government: a story of insubordination and sabotage, of documents removed from the president’s desk and orders to the military flatly disobeyed. But once the episodes leaked to the press in advance of the book’s publication are put into context, what they reveal instead – far less dramatically – is a pattern of incompetence and dysfunction that allowed power struggles to form and officials to abuse their position. Woodward’s suggestion that what took place is an ‘administrative coup d’etat’ seems especially overblown. If there was a coup, who are the conspirators? Where is the junta? 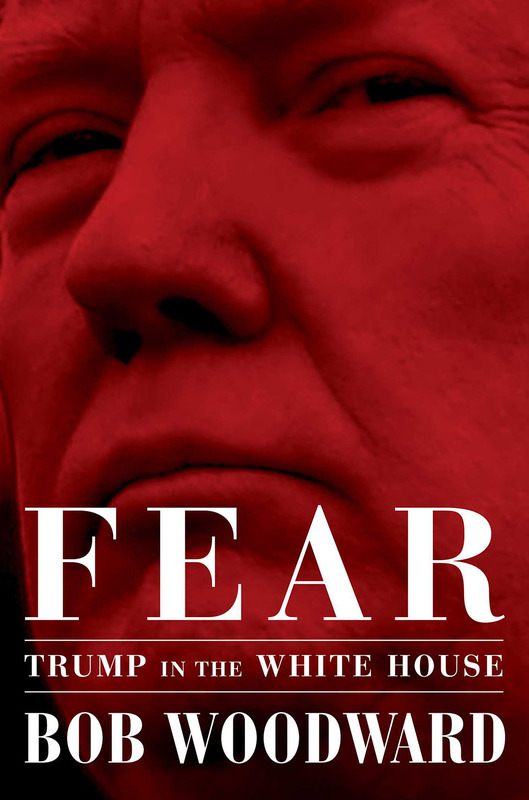 Fear is a chronicle of the first fourteen months of the Trump White House, a span of time defined by the longevity of Woodward’s sources. The book’s main informants are chief of staff Reince Priebus, chief economic advisor Gary Cohn, legal advisor John Dowd, strategist Steve Bannon, campaign manager Kellyanne Conway and staff secretary Rob Porter. Of these, only Conway is still in Trump’s employ but her conversation with Woodward was limited to a brief account of her role in the campaign of 2016. The book ends when it does – around the day John Dowd resigned, in March of this year ­– simply because it runs out of people. he concluded it would be best for all – his former spouses, his family and close friends, the White House and himself – to resign. He wanted to focus on repairing relationships and healing. Until that time, Porter had acted like the very model of ‘the resistance inside the White House’ which spoke last week through an anonymous op-ed in the New York Times. That is, more prosaically, as a knower of rules and stickler for process who used his knowledge of how government works – a rare commodity in Trump’s team – to either delay or prevent the president from signing executive orders that he personally found objectionable. What he objected to, as it turns out, were Trump’s attempts to enact the anti-trade portion of his agenda. That’s why he ‘screamed bloody process’ (Porter’s own expression) to defend NAFTA, the free trade agreement with South Korea and the Paris Climate Accord (which is not strictly a trade agreement, but reflects the same philosophy concerning the place of the United States in world affairs). By contrast, even though Woodward tells us that Porter viewed Trump’s equivocating comments after the neo-Nazi rally in Charlottesville as a ‘breaking point’, he seems to have done nothing to impede the Muslim ban or the administration’s holding Dreamers to ransom in order to secure financing for the wall along the border of Mexico. He also failed to resign for six whole months after reaching this breaking point, and eventually did so only when forced to by a personal scandal. There is ample reason to doubt Porter’s heroic self-portrait, then, but this seems of little concern to Woodward. This is an issue with all of the first-person narratives disguised as reporting in the book. Thus John Dowd, who was the head of Trump’s legal team during the first year of the Mueller probe, gets to tell the story of the investigation firmly from the perspective of the president. Even the book’s ‘big reveal’ in this section – namely, that Dowd resigned because Trump decided to speak to Mueller against his advice (‘you’ll end up in a jump suit’ is the sound bite) – doesn’t take us any closer to the truth of the case. It only speaks to Trump’s all-obscuring personality. Woodward dealt with these problems by structuring his material chronologically, episodically, as opposed to thematically. Had the book teased each of the strands out instead, it might have highlighted more effectively the nature of the power struggle inside the White House. Far from an administrative coup d’etat, this was a struggle for the soul of the Republican Party and the conservative movement. To use the administration’s own language, it was the globalists versus the Americanists: the people who believed in the system of economic and military alliances over which America had presided since the end of the Second World War, on the one hand, the and followers of the Bannon doctrine on the other. And even though Trump had campaigned on the tenets of that doctrine – an end to most immigration, an end to trade deals, an end to foreign wars – Trump’s own cabinet and senior advisors were evenly split on either side of that divide. Once the reader has pieced it together, the book tells the story of how Bannon’s side got his way on trade and immigration even though Bannon himself was long gone by then. However, it should be considered a provisional victory, as the tension between the racist populism that wins elections and the military and economic pragmatism on which American power rests will continue to tear at the fabric of the Republican Party in the years to come. Image: crop from cover of Fear. So, another Watergate expose it ain’t, then?! No, in fact I’m not sure if it’s been commented on but it’s pretty clear that Woodward is highly sceptical of the Mueller probe. Yes, that was the gist – if you’re going to kill the king, kill the king – as Machiavelli sort of put it, prior to Emerson.